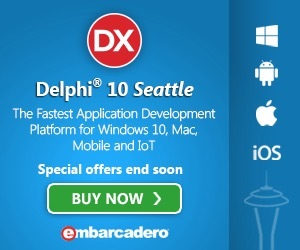 I do this website mostly for fun and to contribute back to the Delphi community that has give so much to me. But hey, I'm not entirely selfless -- If I can pick up a few bucks or some other goodness while doing all this, well, I'm not shy. So, if you feel like helping out, please don't hesitate. The best thing you can do is buy Embarcadero RAD Studio XE4 from me. Just use that link. Buy something from Amazon after clicking on this link , or any other Amazon-based link on my site. I'm not shy about sprinkling my posts with the links, so I'd be appreciative if you came by here on your way to Amazon. Sign up for DropBox. I get more DropBox space if you sign-up from my link. Sign up for an account at DiscountASP.NET. I've been really happy with their service, and am not hesitant to recommend it. If you click through that link and sign up, I get a nice referral credit. Join up or otherwise participate at Swagbucks.com. It's kind of silly, I know, but if you sign up I get bonuses, and then if you do stuff there -- take surveys, search, etc. -- I get more SwagBucks. I plan on redeeming them all for Amazon gift cards for what it is worth. Of course, if you are really feeling awesome, you can always just flat out make a cash donation to me via PayPal.